Upton TC31. 2.2 grams steeped for 3 minutes at 212℉. Impression: Broken orange pekoe-size bits, see photo. Dry tea smells floral. Brewed tea scent is yeasty, malty. Taste: floral, stone fruit, old paper, tobacco, oregano, weeds, pond muck. Moderately astringent. 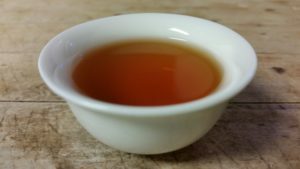 Ceylon black teas are quite variable in taste. Some are lovely; some have tastes that are jut not right for me. This is one of the latter. 2.1 grams steeped for 3 minutes at 212℉. Impression: bag tea, see photo. 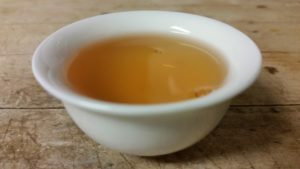 Brewed tea scent is faintly spicy and yeasty. Taste: flat, thin, brackish. Slight maltiness, mainly in the finish. Moderately astringent. I wanted tea to take to Readercon, without the bother of bagging my own bulk tea, so I bought a Twinnings Black Tea Variety Pack. 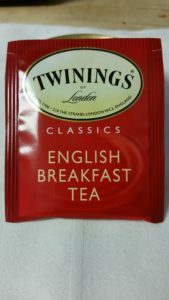 It contains English Breakfast, Earl Grey, Lady Grey, and Irish Breakfast. The English Breakfast was disappointing. Twinnings is loved by many, but not, apparently, me. I suspect I’ve been spoiled by the bulk teas of good by-mail suppliers, like Upton and Yunnan. The package says this tea is a blend of Kenyan and Assam. I’ve never had Kenyan, though it was recommended to me recently. I will try a different source for Kenyan at some time. 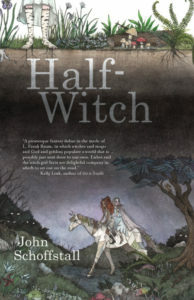 My debut novel, Half-Witch, is published today by Big Mouth House, an imprint of Small Beer Press. Lizbet Lenz, fifteen years old, lives in a Europe that lost its way on the road to modernity. The sun still goes around the earth. Goblins lurk in cellars and witches conspire in the forests. The war between God and Satan is going badly for the home team. Lizbet has spent a lonely and friendless childhood fleeing from one town to another with her father Gerhard, a charming swindler never more than a step ahead of the law. When Gerhard is jailed for his crimes, only Lizbet can free him. In the company of Strix, a clever, worldly, and sarcastic witch girl who is Lizbet’s opposite in every way, Lizbet undertakes a perilous journey over mountains that encircle the world. And that’s just the start of her troubles! Half-Witch is being marketed as middle-grade, but it should be accessible to readers of all ages. Ebooks compatible with Kindle and other e-readers are available at the link above. Half-Witch is also available on Amazon, Barnes & Noble, or at your local bookstore. I hope you enjoy Half-Witch! I recently learned from friend and fellow-SFF writer Trent Hergenrader that there is a tabletop RPG (The Warren) that sounds like Richard Adams’ Watership Down with the horror elements amped up. Watership Down is mostly a romance of adventure, danger, flight, with some mystical/wonder stuff. But there is horror, too. [Spoilers follow] In one section of the novel the main rabbit cast meets a colony of rabbits who are living in the wild but being maintained by a farmer who puts out food for them and protects them from predators. He also sets traps now and then when he wants a meal of rabbit. The rabbits are aware of this, in some rabbity way. They know they lead a charmed life, but at the cost of a rabbit disappearing now and then. They are living a horror story. Instead of fighting or fleeing, however, they have developed a gothy culture that romanticizes death. (Aside: it is this sort of insight and leap of imagination that makes Watership Down a great novel rather than merely a good one. 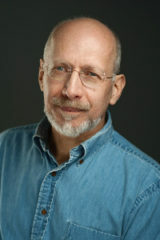 Adams has, in James Blish’s famous phrase, not just ideas, but ideas about his ideas.) The main cast, when they understand the situation, are disgusted and horrified. Adams appears to feel the same way, that the gothy rabbit culture is decadent, even degenerate. Not proper rabbits. It occurs to me that the current kerfuffle over the use of users’ on-line data and our trail of digital footprints across the web has the same moral flavor. We are the gothy rabbits. We have been given a glittery on-line playground of entertaining toys, all for free. But there is a cost. Every mouse click, every keystroke is recorded, analyzed, sold for billions and billions of dollars in the aggregate, and then used to gin up advertisements that exploit, with varying success, the interests we have inadvertently revealed. That dig into our souls to discover what we covet, what we love, what we hate, what we fear, and then use it to sell us stuff. To be fair, viewing an ad for a 100-pack of Harley-Davidson plastic oil pan drain plugs (a recent Amazon ad targeted to me) is not as bad as being snared in a leg trap and turned into rabbit stew. We have made a deal with the devil, but the devil is going easy on us, as these things go. Trading one value for another is a normal part of human life. But this business with on-line personal data is a new situation, a new trade-off. We’re still trying to evaluate it. Are we making the right choices? Is the value we receive greater than the value we give up? Are we being proper rabbits? Upton TC30. 2.2 grams steeped for 3 minutes at 212℉. Impression: uniformly dark BOP-size bits, see photo. 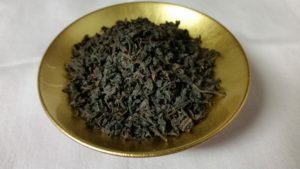 Dry tea has typical spicy black tea scent. Brewed tea scent is toasted, yeasty. Taste: mild, briary, with notes of malt and cardboard. Fruity finish. Strongly astringent. Kandy is a major tea-producing region of Sri Lanka/Ceylon. The maltiness is reminiscent of Assam teas, not usually found in ones from Sri Lanka. I like the malt and the finish, not so crazy about the cardboard.